"I got in and sampled the lot - it's good. I can't look for the raspberrini still right now, there's a hoomin looking at me!" - Thank you, Kohl's Mom! 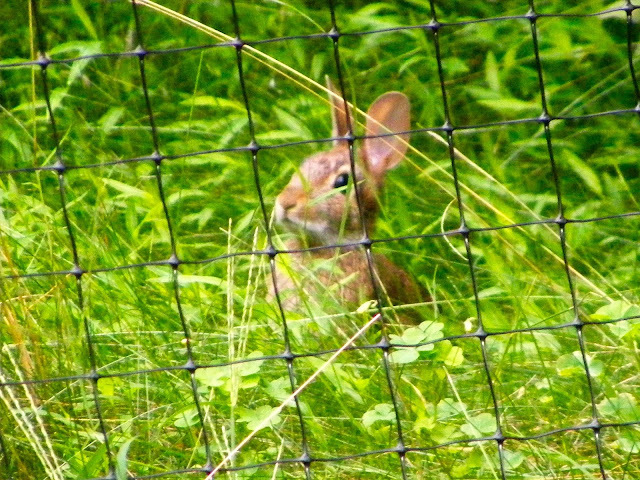 Please find attached a picture of a wild bunny we found *inside* the deer fence (must have dug underneath) enjoying his evening meal a little over a week ago. We do not know his name, but we were nonetheless obligated to send pictures of this live-action display of indigenous disapproval. 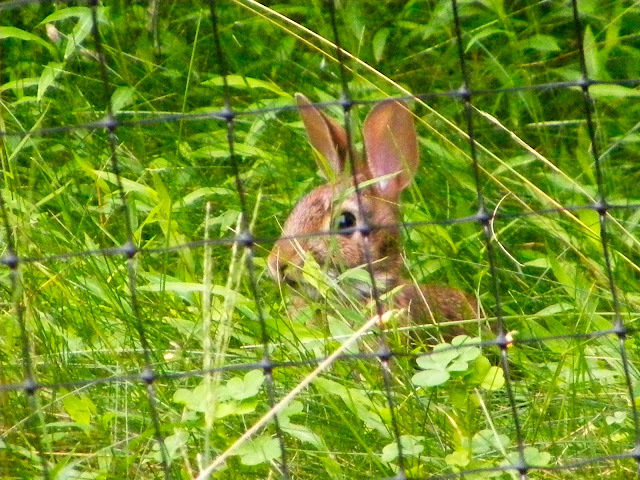 We have lived here for a little over a year, and we have seen all kinds of other critters (foxes, lots of deer, chipmunks (oh, so many chipmunks! ), beautiful birds, raccoons, etc. ), but had not seen a bunny. We recently planted a garden, and ‘coincidentally’ this little guy shows up. Our maximum security prison for vegetables is probably no match for the warren that is certainly on its way. Much love from Kohl’s mom and dad." The old "If you plant it, they will come!" routine! Cute fella. Can't eat THAT much! Your place sounds awesome. I could sit and watch the critters all day, but the Desert Warren would have some serious disapproval if I did. It's about time you invited them for a meal. They were beginning to suspect you were un-neighborly.